Less healthy diets are common in high income countries, although proportionally higher in those of low socio-economic status. Food subsidy programs are one strategy to promote healthy nutrition and to reduce socio-economic inequalities in health. This review summarises the evidence for the health and nutritional impacts of food subsidy programs among disadvantaged families from high income countries. Relevant studies reporting dietary intake or health outcomes were identified through systematic searching of electronic databases. Cochrane Public Health Group guidelines informed study selection and interpretation. A narrative synthesis was undertaken due to the limited number of studies and heterogeneity of study design and outcomes. Fourteen studies were included, with most reporting on the Special Supplemental Nutrition Program for Women, Infants and Children in the USA. Food subsidy program participants, mostly pregnant or postnatal women, were shown to have 10–20% increased intake of targeted foods or nutrients. Evidence for the effectiveness of these programs for men or children was lacking. The main health outcome observed was a small but clinically relevant increase in mean birthweight (23–29g) in the two higher quality WIC studies. Limited high quality evidence of the impacts of food subsidy programs on the health and nutrition of adults and children in high income countries was identified. The improved intake of targeted nutrients and foods, such as fruit and vegetables, could potentially reduce the rate of non-communicable diseases in adults, if the changes in diet are sustained. Associated improvements in perinatal outcomes were limited and most evident in women who smoked during pregnancy. Thus, food subsidy programs for pregnant women and children should aim to focus on improving nutritional status in the longer term. Further prospective studies and economic analyses are needed to confirm the health benefits and justify the investment in food subsidy programs. International research suggests that there are multiple barriers to improving people′s nutrition including the cost and taste of healthy food, poor dietary habits, and a limited understanding of nutritional concepts [3–5]. In high income countries, there has been increasing focus on the increased intake of energy-dense nutrient poor foods by a majority of the population [6–8]. However, low socioeconomic status is associated with lower uptake of health promoting behaviours , including healthy eating [10, 11]. For those on low incomes in high income countries, the cost of healthier food is considered an important barrier to improving the quality of dietary intake [12, 13]. In this context, health promotion and education alone may have little impact in disadvantaged families. Further, structural/ecological interventions, such as food pricing strategies, may have a greater impact on health behaviours than individual interventions alone . Food subsidy programs are one element of food pricing strategies and have been operating for many years in the United States and the United Kingdom. The Special Supplementary Nutrition Program for Women, Infants and Children (WIC) in the United States commenced in 1972 to provide healthy foods, referrals to health and social services and nutrition education to pregnant women and families with young children . The WIC program was developed to target common nutritional deficiencies in the diets of disadvantaged pregnant women and children . It has been evaluated more than any other food subsidy program, with many studies demonstrating improvements in pregnancy outcomes and children′s nutritional status and early intellectual development . However, the rapid uptake of the program nationally made it difficult to conduct robust randomised trials resulting in concerns about selection bias in existing evaluation studies [18–20]. The longstanding Welfare Food Scheme program in the United Kingdom was expanded and renamed Healthy Start in 2006 with a renewed focus on improving the nutrition of low income women and their children . Both WIC and Healthy Start have changed recently to provide more fruit and vegetables (F&V) to address current nutritional challenges in target populations. Food subsidy programs remain topical in other countries; South Korea has trialled a program modelled on the WIC program  and the Food Miles program in Canada provides subsidies to wholesale distributors sending perishable foods by air to remote communities, which has reduced the cost of healthy foods for families in remote locations . A collation of existing evidence may contribute to existing and future initiatives in this area. disadvantaged minorities e.g. Indigenous peoples. Eligible interventions were those that provided subsidized food alone or in combination with other health interventions. The food subsidy programs may have used any direct or indirect strategy to reduce the price of food including policy initiatives, transport and infrastructure subsidies, cross-subsidies. Examples of transport and infrastructure subsidies include the Food Miles program  in Canada which subsidises wholesale food transportation costs to remote communities and the Outback Stores initiative  in Australia which assists remote Indigenous community stores to improve infrastructure and storage processes to reduce the costs of perishable foods. Eligible food subsidy programs had to have provided a 10% or greater reduction in the price of targeted foods because this level of reduction has been shown to impact on food expenditure [30, 31]. Interventions which provided pre-prepared meals to participants (e.g. elderly or frail) were excluded. Systematic literature searching identified 5,328 articles from which 684 were retrieved for abstract review (see Figure 1). There were 16 articles (14 separate studies) which met the inclusion criteria and were included in the systematic review [18, 30, 32, 37–49]. The 14 studies included four RCTs [30, 37, 41, 42], seven CBAs [32, 38, 39, 43, 46–48] and three ITSs [18, 44, 49]. Eleven of the studies were from the United States [18, 32, 38, 40–49] with nine of these focussed on the WIC program [18, 32, 38, 40, 42–48]. Two studies were from the United Kingdom [37, 39] and one from New Zealand . The dates of publication ranged from 1983–2010. The characteristics of included studies are shown in Table 1. Participants in eight of the 14 studies were pregnant women (six WIC [18, 42, 44, 46–48] and two other studies [37, 49]). There were also three WIC studies involving postnatal women [32, 38, 43]. Of the other non-WIC studies there was one study of healthy adults  and another of overweight African-American women . There was also one study of 2–14 year old children . The vast majority of participants were low income, from disadvantaged local areas or from Indigenous or ethnic minority groups. Of the nine WIC studies, there were two ITS studies of routine birth registry data including 28 million births  and 11 million births . There was one RCT  and two larger CBA studies [46, 47] that reported the impact on pregnant women. These larger CBA studies were part of a National WIC evaluation in the 1980s. There were also four smaller CBA studies [32, 38, 43, 48], involving 101–702 participants, which evaluated different aspects of the WIC program. Of the five non-WIC studies, there were three RCTs: one of supermarket price discounts for 1104 regular adult shoppers in New Zealand , one of subsidised fruit juice for 190 pregnant women in the UK  and another of a F&V subsidy for 40 overweight women in the USA . There was an ITS using Californian birth registry data to evaluate the Food Stamp Program in the USA  (renamed the Supplemental Nutrition Assistance Program in 2008) and a 1930s CBA study of supplemental feeding of 1089 children either with family food packages or at school in the UK . The majority (n=9) of the studies appeared to be at moderate to high risk of bias. The studies that satisfied all or most methodological criteria (0–2 relevant criteria not satisfied) and appeared to be at lower risk of bias included three WIC studies- the two ITS [18, 44] and a CBA study of postnatal women , and three non-WIC studies- the RCT from NZ , the ITS of the Food Stamp Program  and the CBA study of supplemental feeding of children from the UK  (Table 1). Sensitivity analysis using only studies judged to be at low risk of bias was not possible due to the limited number of studies. However, the results from these studies are highlighted in the results and/or discussion. Selection bias was a particular concern in the National WIC evaluation CBA studies; controls were less disadvantaged than WIC participants in these studies and 25% of controls were also found to be on the WIC program at follow-up . The interventions included the standard WIC program [18, 42, 44, 46–48] or enhancements to the WIC program with either an additional six months of postnatal supplements [38, 43] or $US10 F&V per week . The standard WIC program includes monthly food vouchers, nutrition education and healthcare referrals at WIC clinics. The food vouchers are for designated quantities of foods including iron-fortified cereal, vitamin C-rich fruit and/or vegetable juice, eggs, milk, cheese, peanut butter, dried beans or peas, canned tuna and carrots (prior to 2009). In 2009, US$10 fruit and vegetables, whole-wheat bread and alternative canned fish were added to packages. Women may receive WIC foods while pregnant and for 12 months if breast-feeding or six months if not breast feeding and children receive foods up to age four years. Non-breast fed infants receive infant formula and all infants are eligible for baby foods from four months . Of the non-WIC studies, interventions included: a 12.5% supermarket price discount on healthier options with or without nutrition education;  subsidised monthly food vouchers up to US$142/month (1974 figures) dependent on income (Food Stamp Program in USA);  free home-delivered fruit juice weekly;  specified family food packages weekly or daily school feeding;  and US$10 F&V weekly with nutrition education at a local community centre . The duration of the interventions ranged from 12 weeks for one of the WIC studies  to 12 months for the family food packages  (Table 1). The presentation of the impact of food subsidy programs on primary outcomes distinguishes between comprehensive food subsidy interventions which subsidise a wide range of food items or an overall package of food (Tables 2 3 4) and those in which only fruit and vegetables or juice are subsidised (Table 5). This reflects that subsidising a range of healthier foods may be more likely to impact on overall dietary intake, but also that increasing intake of fruit and vegetable intake has become an important public health goal given its the potential to reduce the risk of non-communicable diseases. The comprehensive food subsidy studies include all except one of the WIC studies [18, 38, 42–44, 46–48], the supermarket price discount RCT , the family food packages study in the UK  and the Food Stamp Program ITS . The fruit and vegetable subsidy studies include the home-delivered fruit juice  and the subsidised fruit and vegetables at the community centre  and fruit and vegetables as an enhancement of the standard WIC program . Nine of the studies (6 WIC [32, 40, 42, 43, 46–48] and 3 other studies [30, 37, 41]) reported participants′ nutritional status or dietary intake. Six of these studies reported dietary intake information using either 24 hour recalls [32, 47, 48] or food frequency questionnaires [37, 41, 43]. Two of the studies reported food purchases [30, 46], with the more recent study using electronic shopping data . Four studies reported on biomarkers of nutritional status [37, 42, 43, 48], with three studies reporting on both biomarkers and dietary intake [37, 43, 48]. Health outcomes were reported by ten of the studies (seven WIC [18, 38, 42–44, 47, 48] and three other studies [39, 41, 49]), with all the WIC studies reporting pregnancy-related outcomes. Four of these studies reported health outcomes together with dietary intake measures [41, 43, 47, 48]. Only the three ITS studies reported pregnancy-related health outcomes without any nutritional status measures [18, 44, 49]. Three RCTs [30, 37, 41] and one CBA study  reported on F&V intake/purchases. There were consistent and significant increases in the measures of F&V intake in these studies (Tables 3 and 5). Only the supermarket price discount RCT was a comprehensive food subsidy. In this study, Ni Mhurchu et al. showed an increase of 0.48kg/week (95% CI 0.21-0.75) of healthier F&V purchased, which was an 11% increase from baseline after 6 months of a 12.5% supermarket price discount intervention. At 12 month follow-up (6 months after intervention) increased purchases of healthier F&V (0.28kg/week 95% CI 0–0.56) persisted, but was attenuated . This was a large RCT (n=1104) that met most quality criteria and with a low risk of bias, however, there was no change in the primary outcome, saturated fat purchases, in this study (Table 3). The remaining three studies assessed limited subsidies of either F&V or fruit juice. None were assessed to have a low risk of bias. In the community centre F&V RCT (n=40), Kennedy et al. reported that overweight women who received US$10/week of F&V for six months increased mean consumption of fruit by 1.0 serves/day (95% CI 0.1-1.9, p=0.02) and vegetables by 0.9 serves/day (95% CI 0.3-1.5, p=0.002) compared to controls, whose intake was unchanged . Burr et al. assessed the impact of free home-delivered fruit juice and/or nutrition education throughout prenatal care on the overall fruit intake of pregnant females in a RCT (n=190) in the UK . Among those who received subsidised juice, there was a net increase of 34.8% in the proportion consuming more fruit juice, while the intake of fruit juice declined among the control (−7.9%) and nutrition education groups (−24.3%). Herman et al. assessed the impact of an additional US$10/week fruit and vegetable subsidy for six months for WIC participants in California at either a supermarket or farmer′s market in a CBA study [32, 40]. Participants receiving subsidised F&V consumed 4.1 serves/4186kJ/day (Supermarket) or 3.9 serves/4186kJ/day (Farmer′s market) while controls consumed 3.0 serves/4186kJ/day (F=9.75, p<0.001). This increase persisted in both groups 6 months after the intervention (Table 5). Four comprehensive food subsidy programs reported on other dietary outcomes: the supermarket price discount RCT  and three WIC CBA studies [43, 47, 48] (Table 2). In the supermarket price discount RCT, the only study with a low risk of bias, Ni Mhurchu et al. found that a 12.5% price discount significantly increased purchases of total (0.90 kg/week 95% CI 0.29-1.52) and healthier food (0.79kg/week 95% CI 0.43-1.16) after 6 months . The most comprehensive estimates of dietary intake were from the National WIC evaluation which assessed 6563 pregnant women . This study reported that the intake of most macronutrients and micronutrients were 10-20% (p<0.05) higher among WIC participants compared to controls, including four of the five nutrients targeted by the WIC program: protein, calcium, iron and vitamin C. The smaller CBA studies showed variable results: Bailey et al. found intake of folate was higher, iron and B6 the same, and protein lower among prenatal WIC participants;  Pehrsson et al. found no difference in iron intake between postnatal WIC participants and controls . Six WIC studies reported on mean birth weight and low birth weight <2500g (LBW) proportion- 1 RCT , 2 ITS [18, 44] and 3 CBA studies [38, 47, 48] (Table 2). The Food Stamp Program ITS study  also reported on LBW (Table 2). All of these were comprehensive food subsidy programs. The three ITS studies were the only ones among these studies assessed to have a low risk of bias. As sufficient data were available, Cochrane Review Manager 5  was used to produce a forest plot, with weighted mean differences and 95% confidence intervals for mean birth weight in the WIC studies. The heterogeneity of study designs and missing data precluded the reporting of a summary statistic for mean birth weight. However, overall there would appear to be a small increase in mean birth weights as reflected in the forest plot of this outcome for WIC studies (Figure 2) and a non-significant trend to decreased rate of low birth weight among WIC participants. The two WIC ITS studies reported on birth weight trends during the 1970s when the WIC program was progressively implemented in the USA. Hoynes et al. found a significant 2.7g increase in mean birth weights in the total sample attributable to WIC (Mean birth weight 3316g), which they estimated as a 29g increase in infants of WIC participants, based on WIC participation rates . Rush et al. estimated that WIC participation increased mean birth weight by 23g (mean birth weight 3335g p<0.05) . The WIC RCT found a non-significant 91gram increase in mean birth weight of infants whose mothers received WIC during pregnancy (WIC 3254g vs. Control 3163g p=NS) after adjusting for maternal weight . The National WIC evaluation CBA study found a non-significant 7 gram increase in mean birth weight (WIC 3292g vs control 3285g p=NS) [45, 47]. In the two smaller CBA studies, Bailey et al. showed mean birth weight was 47g lower in WIC infants (although statistically non-significant) (WIC 3229g vs control 3276g p=NS)  and Caan et al. found mean birth weight of WIC infants 131g higher (WIC 3468g vs control 3337g p=0.003) . Two studies reported on the impact of prenatal WIC participation among smokers. In the WIC RCT, the mean birth weight of infants of WIC participants who smoked (>10 cigarettes/day) was significantly higher than those of controls who smoked (WIC 3235g vs control 3059g, p=0.017) . Bailey et al. found that whereas there was significantly lower mean birth weight among smokers compared to non-smokers in the control group, the WIC smokers had (non-significantly) higher mean birth weight than WIC non-smokers . The three ITS studies showed no significant impact on LBW proportions. Hoynes et al. reported no change in the proportion of low birth weight due to WIC (% LBW=7.2%) . Rush et al. reported a non-significant decrease in LBW proportion of 0.43% among WIC participants (Total sample % LBW=6.84%) . In the Food Stamp study, Currie et al. found no significant changes overall in low birth weight in California after the introduction of the Food Stamp Program in the 1960s . In the National WIC evaluation CBA study, a non-significant decrease of 1.13% in the proportion of LBW was reported (WIC 5.62% vs control 6.75% p= NS) . There were non-significant changes in % LBW in the two smaller WIC CBA studies and the RCT, Bailey et al. (WIC 5% vs control 10%, p=NS) , Caan et al. (WIC 3.2% vs control 5.1%, p=0.08)  and Metcoff et al. (WIC 8.7% vs control 6.9%, p=NS) . Only the two National WIC evaluation studies by Rush et al. [44, 47] and the Caan et al. study  adjusted LBW proportion for gestational age. 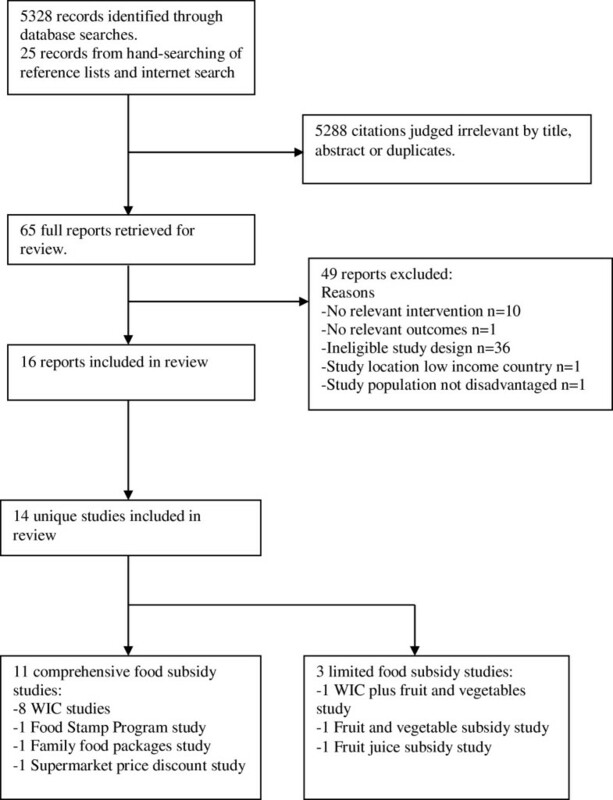 Four comprehensive food subsidy programs- all WIC studies- reported maternal anthropometry and/or haematological parameters. [38, 42, 43, 47] Only the CBA study by Pehrsson et al. was assessed to have a low risk of bias. Three CBA WIC studies reported maternal haemoglobin (Hb) levels (Table 2): Rush et al. in the national WIC evaluation found a non-significant 0.06g/dL increase in Hb among prenatal WIC participants . Pehrsson et al. and Caan et al. found postnatal WIC participation significantly increased Hb by 0.61g/dL (5%)  and 0.29 g/dL (2.4%)  compared to controls respectively. Three studies also reported on maternal anthropometry (Table 2). In the WIC RCT, Metcoff et al. found prenatal WIC participants had greater weight gain during pregnancy (p=0.19) . Rush et al. found that WIC participants started with significantly lower weights in early pregnancy, but had identical weight in late pregnancy to controls . Caan et al. found maternal de Quetelet′s index decreased significantly during pregnancy . The inclusion of 10 non-randomised studies increases the possibility of selection bias and residual confounding as alternative explanations for the positive impacts of food subsidy programs discussed above. In addition, only one of the four RCTs was assessed as having a low risk of bias. Thus, the overall quality of the evidence is limited and the findings should be interpreted cautiously. The heterogeneity of both study design and outcomes also prevented meta-analysis and limited the precision of estimates of effect. The studies assessed to have a low risk of bias (one RCT , 3 ITS studies [18, 44, 49] and one CBA study ) found a range of improvements in food purchases, nutritional biomarkers and perinatal outcomes that have significance for the health of the population. As with other complex public health interventions, there may be practical and ethical limitations on undertaking RCTs, and it will remain important to assess all available high quality evidence with due attention to the limitations of the overall evidence base. There were also limitations in individual studies. Most studies reported multiple nutritional outcomes without specifying a primary outcome, which increases the likelihood of significant associations occurring by chance . Much of the dietary intake data was based on self-report, which has well recognised limitations due to imprecision and potential recall biases . Biomarkers, such as carotenoids and vitamin C, and electronic shopping data are more precise and objective measures of dietary behaviour with different potential biases [55, 56]. Thus, greater use of these measures has the potential to complement self-reported intake data. There were limited data reported on the health and nutritional outcomes for children and no data for men. WIC studies have reported nutritional improvements in children [57, 58], but more rigorous study designs would strengthen these conclusions. An exclusive focus on women and young children in food subsidy programs does not reflect completely the social dynamics that shape dietary behaviour . Research involving whole families would increase the understanding of the wider impacts of food subsidy programs. Although only limited adverse effects were reported in these studies, this is more likely to indicate the absence of evidence rather than evidence of no adverse effects. There should be improved efforts to identify all impacts of food subsidy programs. The findings of a positive impact on birth weight in this review contrast with those of D′Souza et al. ,. who concluded that the WIC program did not have a significant impact on birth weight or the likelihood of low birth weight, except possibly for smokers. The conclusions in this review of WIC′s impact on birth weight were based particularly on the two ITS studies [18, 44] (assessed as low risk of bias) that were not included in the D′Souza et al. review. However, the modest impact on perinatal outcomes supports their suggestion that food subsidy programs should focus on improving nutritional status with the aim of improving longer term health outcomes. In this review, only Gunnell et al. reported long-term health outcomes, finding no mortality benefit from a 12 month childhood food subsidy program. This 12 month program was the longest intervention included in the review. However, a 10-20% increase in key nutrients or 1–2 serves of F&V/day have the potential, if sustained, to decrease rates of non-communicable diseases, including ischaemic heart disease, cancer and diabetes, and ultimately mortality. Prospective longitudinal studies have confirmed the association between healthier nutrition and better health outcomes [60–62]. For example, it is estimated that for each additional serve of F&V consumed, there is a 4% decrease in the risk of coronary heart disease [62, 63]. These reductions in chronic disease prevalence were found in a relatively affluent and well-nourished cohort and the benefits may be greater in a more disadvantaged group. The evidence of sustainable impacts on dietary behaviour as a result of food subsidy programs in both adults and children is limited. Only two included studies reported on follow-up post-intervention- both after subsidies of six months duration- and found persistence of significantly increased F&V intake  and healthier food purchases  at 12 months respectively (though 50 % less than while receiving the food subsidy in the latter study ). The WIC program provides food subsidies for longer (up to age five for children), however, Rush et al. found that the dietary intake improvements in children were only seen in current WIC participants. The optimal duration and design of food subsidy programs is unlikely to have a simple answer given the complex influences on dietary behaviour  but remains important given the link between lower socio-economic status and less healthy nutrition [3, 66]. Longitudinal controlled studies of sufficient duration which quantify the extent of any reductions in chronic diseases from specified improvements in nutrition would build the strongest possible evidence base for food subsidy programs. However, most evaluation research of food subsidies is likely to focus on measures of nutritional intake as markers of improvement. Future nutrition intervention evaluations should use robust validated nutritional intake measures reported in a standardised format (eg. repeated 24 hour recalls) to enable comparisons with other studies including meta-analysis . As discussed, the use of objective measures, including biomarkers and electronic shopping data, should be considered as alternatives to self-reported intake data where feasible. Assessment of the overall diet, using principle component analysis or comparison with dietary indices, is another alternative that provides realistic data to complement other dietary intake assessments [68, 69] and addresses the inherent limitation of significance testing when evaluating multiple outcomes, discussed above. Further economic analyses based on high quality outcome studies would provide complementary data to help determine whether new or amended food subsidy program represent an effective investment within a country. Such analysis would facilitate comparison of potential cost-savings in the health system with the tangible upfront public funding required. In the USA, positive cost-benefit analyses are part of the explanation for the investment in food subsidies [70, 71]. However, D′Souza et al. concluded that the WIC economic analyses were of poor quality. An evaluation of the Healthy Start program in the UK [72, 73] was limited by the long-standing commitment to welfare food entitlements which prevented allocation using randomisation. This will reduce the strength of economic analyses based on such data.